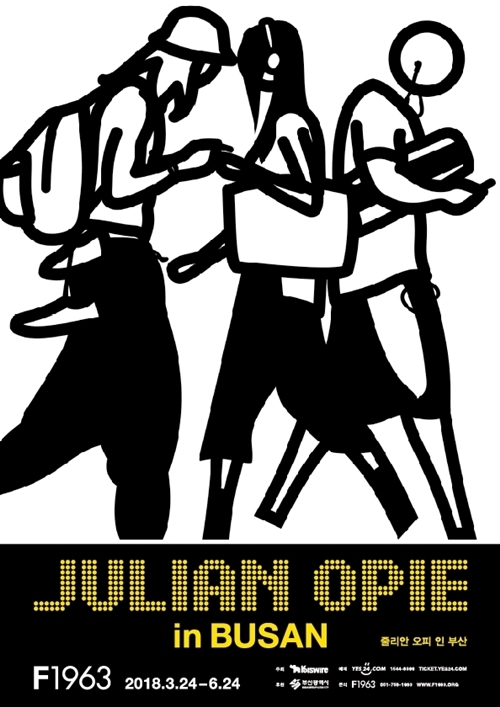 F1963 is pleased to present the first solo exhibition in Busan by British artist Julian Opie (1958). Conceived by the artist especially for the museum, the exhibition includes over 48 works from the artist’s London studio as well as three large-scale site-specific installations. With public commissions from Seoul to New York, Luxembourg to Zurich and an uninterrupted flow of large museum exhibitions internationally, the work of Julian Opie is known throughout the world. Opie’s distinctive formal language is instantly recognisable and reflects his artistic preoccupation with the idea of representation, and the means by which images are perceived and understood. Taking influence from classical portraiture, Egyptian hieroglyphs and Japanese woodblock prints, as well as public signage, information boards and traffic signs, the artist connects the clean visual language of modern life, with the fundamentals of art history.